We’d love your help. Let us know what’s wrong with this preview of Te Kōrero Ahi Kā by Grace Bridges. To ask other readers questions about Te Kōrero Ahi Kā, please sign up. Showcasing stories and poems by my colleagues from New Zealand's vibrant speculative fiction community. I loved this collection for its down under flavour and startling diversity. A mixed bag, which is to be expected of an anthology, but overall a great initiative by SpecficNZ to support and demonstrate the quality of Kiwi speculative fiction. "The Nineveh" by Mouse Diver-Dudfield ; an A mixed bag, which is to be expected of an anthology, but overall a great initiative by SpecficNZ to support and demonstrate the quality of Kiwi speculative fiction. A total of 32 stories with foreword by author Juliet Marillier, this collection of short stories is quite intriguing and I found myself very easily immersed in each one. I found each story to be unique from each other some are fun Firstly, I want to give my special thanks to Lee Murray who helped me get a copy across the Tasman to Sydney, Australia. With my love of urban/speculative fiction stories that are inspired by culture, I was most excited to add Maori speculative fiction to my collection. This was an anthology of short stories and some poems: evocative, poignant, creepy, funny, scary, thought-provoking - it had the lot, all with a distinctive New Zealand flavour. These stories, all very different to each other, evoke the beautiful country of New Zealand with descriptions of landscapes, the mention of Maori legends and unique New Zealand wildlife. It certainly made me want to go back there again for a visit! The stories made me gasp, made me laugh and made me think. For all those r This was an anthology of short stories and some poems: evocative, poignant, creepy, funny, scary, thought-provoking - it had the lot, all with a distinctive New Zealand flavour. The stories made me gasp, made me laugh and made me think. For all those reasons, it gets 5 stars from me, highly recommended. 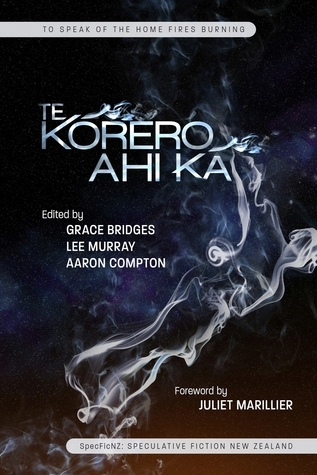 A sampler of short stories from New Zealand's writers of "speculative" fiction. Every story is different - fantasy, sci-fi, horror, and sometimes just a twist to surprise you. The prevalence of Maori concepts and myths marks the book as truly Kiwi, but most of the stories are universal in their appeal. If the story you are reading makes your heart race, the next one will probably make you laugh or cry. Grace Bridges has been in love with language her entire life. She’s a geyser hunter, cat herder, professional editor, and also translates German and French. Indie publishing and freelance editing have been her focus for the past ten years, including 40+ titles in her Splashdown Books brand. She has written several novels in space opera, Irish cyberpunk, and in 2017 an urban fantasy series set in N Grace Bridges has been in love with language her entire life. She’s a geyser hunter, cat herder, professional editor, and also translates German and French. Indie publishing and freelance editing have been her focus for the past ten years, including 40+ titles in her Splashdown Books brand. She has written several novels in space opera, Irish cyberpunk, and in 2017 an urban fantasy series set in New Zealand, beginning with Earthcore Book 1: RotoVegas. Her short stories and non-fiction appear in various anthologies and online magazines. Grace loves to show people that it’s easy to make books—but also insists on top quality writing and design. See www.gracebridges.kiwi for more information.